Ansel Adams was a visionary figure in nature photography and wilderness preservation. He is seen as an environmental folk hero and a symbol of the American West, especially of Yosemite National Park. Adams' dedication to wilderness preservation, his commitment to the Sierra Club, and of course, his signature black-and-white photographs inspire an appreciation for natural beauty and a strong conservation ethic. 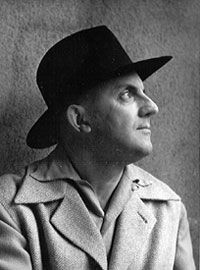 Ansel Adams (1902-1984) was born in San Francisco four years before the great earthquake of 1906. An aftershock of the earthquake threw him to the ground, breaking his nose and marking him for life. He spent his childhood days playing in the sand dunes beyond the Golden Gate where he gained an appreciation for nature, which would become his primary source of photographic inspiration. Adams first visited Yosemite in 1916 -- only two years after John Muir's death and three months before the founding of the National Park Service -- and was transfixed by the beautiful valley. In 1919, at age 17, he had his first contact with the Sierra Club when he took a job as custodian of the Club's LeConte Memorial Lodge, the Club headquarters in Yosemite National Park. Adams' interest in photography grew and often brought him up to the mountains accompanied by a mule laden with photographic gear and supplies. In 1927, Adams participated in the Club's annual outing, known as the High Trip, and, the next year, he became the Club's official trip photographer. In 1930 he became assistant manager of the outings which consisted of month-long excursions of up to 200 people. Adams' role in the Sierra Club grew rapidly and the Club became vital to his early success as a photographer. His first photographs and writings were published in the Sierra Club Bulletin. Adams also got involved politically in the Club, suggesting proposals for improving parks and wilderness, and soon became known as both an artist and defender of Yosemite. In 1934, Adams was elected as a member of the Board of Directors of the Sierra Club, a role he maintained for 37 years. His tenure spanned the years that the Club evolved into a powerful national organization that lobbied to create national parks and protect the environment from destructive development projects. Adams' images were first used for environmental purposes when the Sierra Club was seeking the creation of a national park in the Kings River region of the Sierra Nevada. Adams lobbied Congress for a Kings Canyon National Park, the Club's priority issue in the 1930's, and created an impressive, limited-edition book, Sierra Nevada: The John Muir Trail, which influenced both Interior Secretary Harold Ickes and President Franklin Roosevelt to embrace the Kings Canyon Park idea. The park was created in 1940. In 1968 Adams was awarded the Conservation Service Award, the Interior Department's highest civilian honor, "in recognition of your many years of distinguished work as a photographer, artist, interpreter and conservationist, a role in which your efforts have been of profound importance in the conservation of our great natural resources." In 1980 Adams received the Presidential Medal of Freedom, for "his efforts to preserve this country's wild and scenic areas, both on film and on earth. Drawn to the beauty of nature's monuments, he is regarded by environmentalists as a national institution." Adams was often criticized for not including humans in his photographs and for representing an idealized wilderness that no longer exists. However, it is in large part thanks to Adams that these pristine areas have been protected for years to come. Why was Ansel Adams revered by Americans as no other artist or conservationist has been? William Turnage explains: "More than any other influential American of his epoch, Adams believed in both the possibility and the probability of humankind living in harmony and balance with its environment." Ansel Adams was a dedicated artist-activist, playing a seminal role in the growth of an environmental consciousness in the U.S. and the development of a citizen environmental movement. His photographs continue to inspire the artist and conservationist alike. 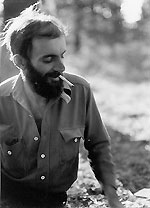 Photographs of Ansel Adams courtesy Cedric Wright/Sierra Club Archives. All rights reserved.